2012 i3 scholar, Jamar Smith, is a first year master of information management student at the Syracuse University School of Information Studies, in New York State. A former statistics major at the University of New Mexico, Smith contemplated a different path before attending the i3 program. As an i3 scholar, he and his project group conducted research using Twitter data to analyze the 2012 presidential election. Their project titled “The promise of social media in political engagement: Examining the presence and engagement of monitorial citizens” was accepted and presented at the 2014 iConference in Berlin, Germany. Accepted to the University of Pittsburgh, Rensselaer Polytechnic Institute, and Syracuse University, Jamar’s decision came down to one thing: hearing back about funding. “Syracuse really reached out, they Skyped me and made personal phone calls. They were very eager to recruit an i3 Scholar.” He chose Syracuse and decided to concentrate in information security management. Today Smith’s daily routine includes attending classes, doing homework, and working two faculty assistantships (The first for Twitter analysis, a position his i3 project helped him land, and another project on information security of a smart grid). 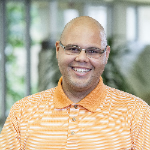 He also serves as the Graduate Employer and Alumni Coordinator in the Black and Latino in Information Science and Technology Support (BLISTS) group. It is his duty to identify and contact Syracuse alumni to interview each month on jobs and how they came up against, and overcame, challenges throughout graduate school and their careers. Now near finishing his first year as a graduate student, Jamar looks forward to his Asia Tech Study abroad experience in Hong Kong, Singapore, Malaysia, and Bangkok this summer. He leaves the following advice. To Undergrads: Make sure to list all of your accomplishments and skills on a resume. It’s not bragging. To Fellow Grad students: Don’t be afraid to ask for funding! Reach out to your program directors. Learn how to manage your time. To All i3 Scholars: Be open to helping your i3 peers by answering questions, helping them make decisions, and talking about campus programs.